We just learned about the Rajagopuram. 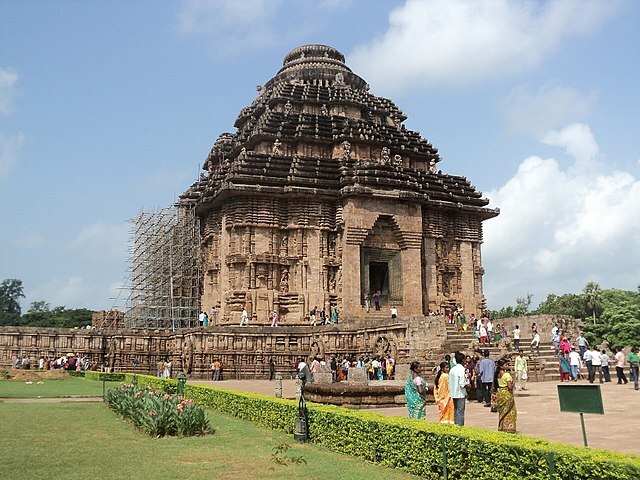 Another Indian sculpture is the Konark Sun Temple, built around 1238 AD in Konark, Odisha, India. The name Konar comes from the words Kona meaning "corner" and Arka meaning "the sun". This 100 foot Hindu temple is made to look like a giant chariot with wheels being pulled by horse sculptures. There are 24 wheel sculptures, and each one is over 12 feet tall. There are seven horse sculptures made to look like they are pulling the chariot. It has sculptures all over the building, and some other sculptures around it like elephants and people. Next to the temple is another building called the Nata Mandir, which means Dance Temple. We just learned about the Ellora - Buddhist Caves. Another part of ancient Indian artwork is the Ellora - Hindu Caves. In the same place as the 12 Ellora Buddhist Caves, there are 17 Caves that were used for Hindu worship. There are statues of Hindu gods and goddesses in these caves for Hindu people to worship, and the caves were built with a waterfall flowing over top. These caves were actually carved out close to 100 years before the Buddhist caves were made nearby. There are pillars, a temple and many statues and rooms for worshipping. We just learned about the Mokujiki Shonin. We've learned a lot about Japanese sculpture, let's move on now and learn about Indian sculpture. One of the oldest bunch of sculptures in India is the Indus Valley Civilisation which was a place where people lived for thousands of years. People have discovered old sculptures from this place, like bronze pottery, ceramics, shells, jewelry, toys and games.